(Bloomberg) -- South Korea’s oldest chaebol is finding that being a big conglomerate in a weak economy can be difficult. Shares of Doosan Heavy Industries & Construction Co. slid as much as 9.9 percent in Seoul, its lowest since August 2004, after it announced Thursday that its affiliate Doosan Engineering & Construction Co. plans to issue 420 billion won ($373 million) of new shares to secure cash after suffering a massive loss last year. Doosan Heavy would buy 300 billion won worth of the shares. The parent company aims to raise about 958 billion won in total by issuing new shares and selling assets. The proceeds would provide financial support to the construction unit. There’s one problem: Doosan Heavy is also losing money. Market concerns about the conglomerate’s outlook are growing. Shares of Doosan Heavy and holding company Doosan Corp. were the biggest decliners on the Kospi 200 Index in the past month and analysts in Seoul slashed price targets on Doosan Heavy, saying the new share plan was larger than expected. The analysts said they were also surprised by the short-term loan offering for Doosan Engineering. 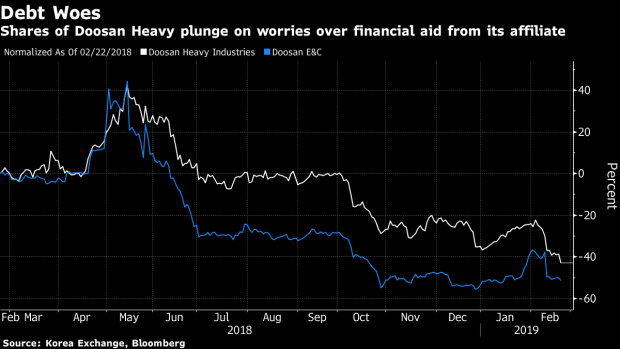 Rating firms have warned of cutting the debt ratings for Doosan Heavy, Doosan Engineering and Doosan Corp.
South Korean companies have struggled as falling global demand hurt exports and domestic economic growth has slowed. But Doosan Group has been especially hit hard because its engineering unit is highly reliant on Korean business outside of Seoul that’s performing even worse than in the capital city, according to Korea Investment Management. The government’s policy of phasing out nuclear power has also taken away a key profit-driver for Doosan Heavy. The group increased debt from big acquisitions in the past including the $5.1 billion purchase of U.S. construction equipment maker Bobcat in 2007. Started in 1896 during the Joseon Dynasty as a linen store, the Seoul-based conglomerate is known as a symbol of South Korea’s economic miracle. After thriving as a drinks maker during the Japan’s colonial rule and after the Korean War, the conglomerate transformed into a heavy industry giant through a series of large-scale acquisitions.